Now that its Spring, and the barbie's definitely out from hibernation, this is a great fish or chicken marinade that's sure to impress anyone. Your family, your guests and even you neighbours. This is a Moroccan dish we've tried at home. The paste is made either using a food processor (if you have one) or a large heavy mortar and pestle (granite or marble ones are best). Then the paste is rubbed on the chicken pieces and left to infuse the flavours for half to one hour. The smell of this when you're cooking them on the pan or on the grill is so inviting, you'd have your neighbours coming out of the homes to get a whiff. We've made this at home several times using Poh's recipe with chicken breast pieces shallow pan fried and made this for a BBQ at a friend's place using chicken thigh pieces skewed with bamboo sticks. We also made a version of this in Kitchen 8 during our Seafood Module and used snapper (with fins trimmed and head cut off and the skins scored). 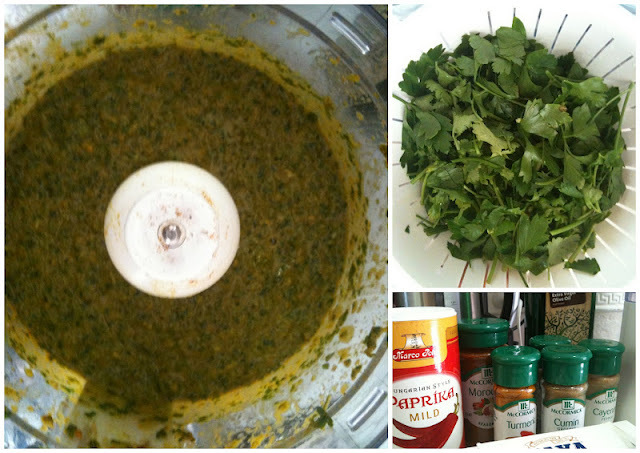 Place all ingredients in a food processor (or a mortar and pestle) and process for one minute. Slowly add the olive oil until you get a thick paste consistency. Place in an air tight container to keep, or in a large bowl if using immediately. Rub onto chicken breast pieces and place in a shallow bowl and set aside for half an hour. Shallow pan fry the chicken pieces 3 or 4 at a time, depending on the size of your pan. Or alternatively, grill the chicken until cooked through. If using snapper, clean the fish and trim off fins and head. Score the skin and rub the paste and set on the grill. You can also make the paste ahead of time as they are good to keep in plastic containers in the fridge for about a week. If you're keeping some of the paste for future use, make sure you separate the amount that you're using from the ones you're keeping. You wouldn't want to contaminate your paste with those you've used to rub the chickens with. Yay! Barbecue season is here! Love this... Mmmm Chermoula!